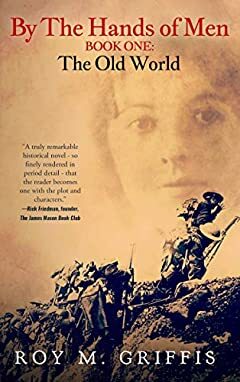 A mere mile from the blood-drenched front lines, Russian refugee and nurse Charlotte Braninov encounters English Lieutenant Robert Fitzgerald, who helps her save the life of another soldier. Robert's calm, courtly manner lingers in Charlotte's mind, a comforting memory amid the deluge of suffering that surrounds her when she returns to the hospital. The Old World, a novel that readers are calling "deeply moving," "stunning," and "magnificent," is the first volume of the By the Hands of Men series. Epic historical fiction by Roy M. Griffis, the saga sweeps across four continents in a gripping tale of fate, loss, redemption, and love.